Breath easier - GingerbreadBoy on call. Ginger has long been known to have powers to settle an upset stomach. Now, evidence suggests ginger may be good for easing the symptoms of asthma. Recent studies both in laboratory animals and in human cells that showed that ginger may help to open constricted airways and allow for easier breathing. It appears ginger blocks the muscles that cause airway obstruction or constriction. 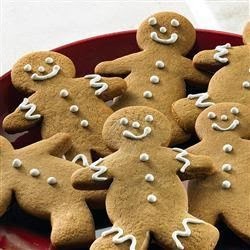 Who knows a gingerbread cookie and a cup of ginger tea may be just what the doctor ordered. 1. Am I a good candidate for a facelift? Ask your plastic surgeon. He or she will advise you, considering your age, skin type and goals. 2. What kind of facelift should I get? Finding the right surgeon is more important than deciding on the right surgical technique. Look at the surgeon's facelift results. If you like them, trust the surgeon's advice to get the results you want. 3. How long does the surgery take, and what is the recovery time? A mini-facelift takes less than two hours. A standard facelift usually takes three to four hours and may take up to six when combined with other things like eyelid or brow surgery. Recovery times differ but, generally, noticeable swelling goes down in 10 to 14 days. 4. How will I look different? A good facelift should make you look younger, more rested and relaxed. 5. What should I look for in a plastic surgeon? Carefully inspect the before-and-after photos on the surgeon's website. You may also ask to see additional photos during your initial consultation. Make sure your surgeon is certified by the American Board of Plastic Surgery (ABPS). 6. What are the risks? As with any surgery, a facelift procedure carries risks. Infection is rare, but possible. Bleeding after a procedure may result in hematomas. Healing is usually uneventful (unless you are a smoker) and nerve damage is usually temporary. The risks are closely related to your surgeon's skills, but there are risks even in the best surgeon's operating room. 7. Should I wait to lose weight before having a facelift? If it is just a few pounds it won't make much of a difference. If it is more, hold off until you feel comfortable with your weight. 8. How long will the effects of a facelift last compared with fillers? Unlike the temporary results from fillers, which may require follow up treatments in a few months, results of a facelift will last for years. How long, of course, depends on skin quality, significant weight changes and environmental factors such as excessive sun exposure. 9. Should I undergo other procedures together with my facelift? A procedure commonly done in conjunction with facelifts is a blepharoplasty or eyelid lift. These procedures are frequently performed together, as indicated by need. If you choose me as your surgeon, these questions and any others you may have will be discussed to your satisfaction during your consultation with me, for which I charge nothing. Do you have "moobs"? Don't use marijuana. It helps to be nuts to live longer. Is testosterone a new health risk? Do birth control pills contribute to glaucoma?